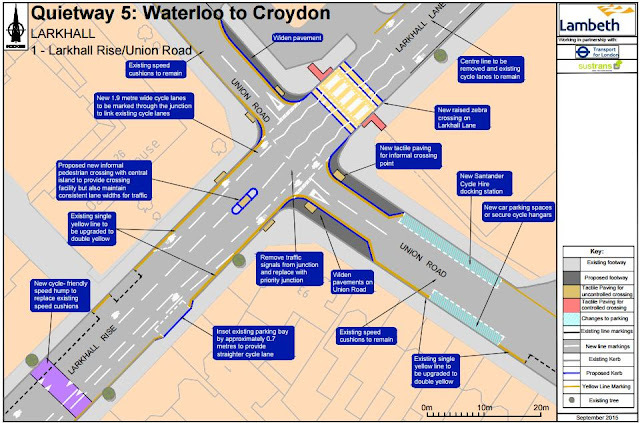 Some Lambeth sections of Quietway 5 from Waterloo to Croydon are being consulted on currently - deadline 5pm on Sunday 4th October. Please comment on them. It's 8.15am on Friday on the wide and straight Larkhall Rise between Clapham and Stockwell. Primary school children are en-route for an 8.30am start, and secondary pupils for 9am. Commuters make their way to work, by foot, cycle and car. The waste collectors are already hard at work. 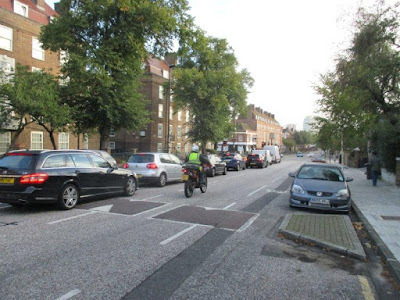 Motor traffic is significantly lighter than on the close and parallel A road alternatives (Wandsworth Road and Clapham Road) thanks to measures installed when this became part of London Cycle Network route 3. But there can still be a fair few cars and vans during rush-hour. The line of cars you see below, queuing at the lights, stretched back further than shown in the photo, and most will turn left. While most drivers turn left, most cyclists go straight on at this junction, and there is a cycle lane and ASL. Last election time, Lambeth Cyclists suggested some changes to Larkhall Rise as part of London Cyclists' 'Ward Asks'. One proposal was to remove the traffic lights in the photos above at the junction of Larkhall Rise/Lane and Union Road. The intention is to lessen journey time, and the energy demand of stopping and starting, for cyclists using the historic LCN3 / soon to be Quietway 5, helping make it a more attractive alternative to the A-roads. A second related proposal was to further reduce motor traffic through an additional filter. Currently motor traffic can only go one-way across a bridge at the top of Larkhall Rise (below). Since at present the traffic must return via an A-road, why not filter the bridge in both directions, so drivers use the A-road in each direction? 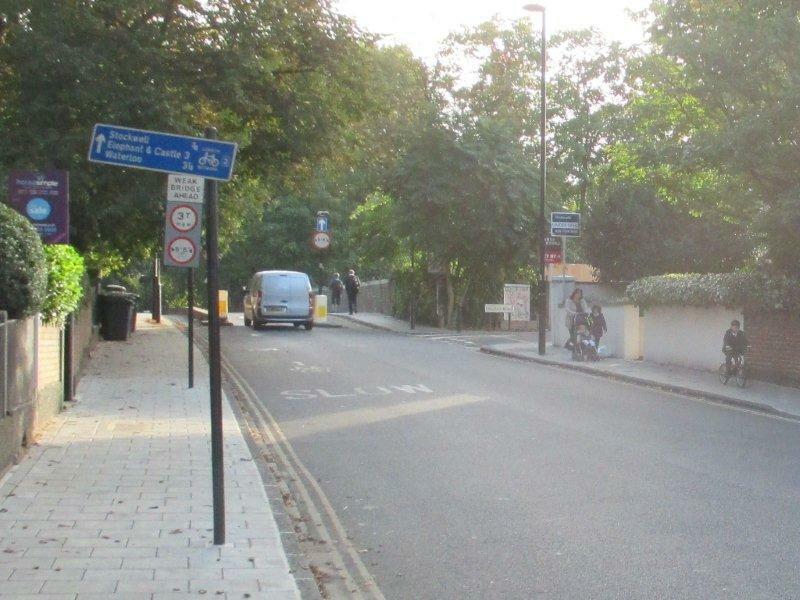 The Quietway plans being consulted on do not include further filtering of motor traffic, but do include removing the traffic lights. This is the design being consulted on. 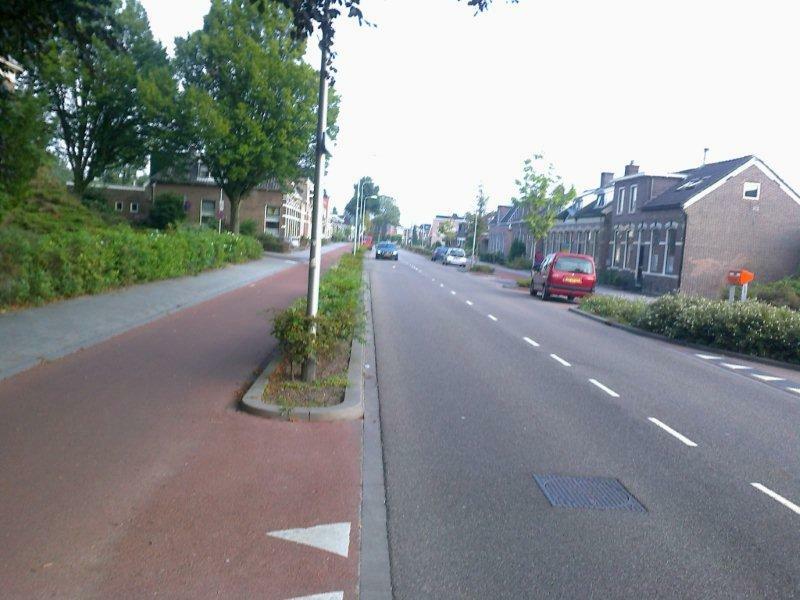 Travelling from the south-west (bottom left), compare the diagram above with the photo below of how it looks now: Past the car parking there will be cycles painted in 'primary' position - the centre of the lane. After the parked cars, approaching the junction, cyclists are provided with a kerb-side advisory cycle lane, but due to the zig-zag lines leading to the Zebra crossing this cannot continue across the junction. Under expected new regulations the zig-zag will however be able to continue the line of the cycle lane, as shown. Without traffic lights the traffic will flow more freely, rather than being bunched at the lights, perhaps similar to the photo above. 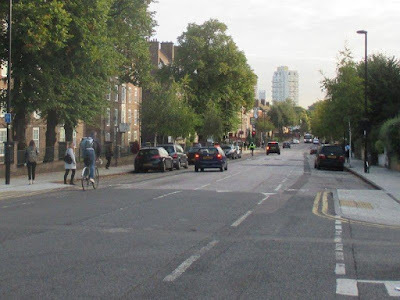 Adults and children cycling downhill will be guided from the centre of the lane to a cycle lane to the left of the predominantly left-turning motor traffic, where the cyclist is in the photo above, then the cycle lane markings will be replaced by a zig-zag at the junction. Bikeability trainers will be advising pupils of the risk of a driver cutting across them here and suggesting that staying in primary position may well be a safer option. This begs the question as to whether this is an adequate Quietway design? Let's consider pedestrians too, crossing Union Road here to continue along Larkhall. Currently the crossing in light-controlled, albeit not exactly on the desire line. Despite most traffic turning left here, there is no Zebra proposed across Union Road, though there is a Zebra across Larkhall. What would I do here? a) I'd spend more time observing here (I'm an occasional rather than a regular user of this route and seldom at rush-hour - maybe my experience on Friday was totally unusual); secondly, I'd talk to existing cyclists and pedestrians here; particularly parents and pupils on their way to school (I saw no children cycling on the road, two on the pavement); thirdly, I'd arrange a cycle/walk about with the local cycling and walking groups well before putting schemes out to consultation. b) I'd review the previously installed filtered permeability for this area to see what improvements could be made to further reduce the amount of traffic on this proposed Quietway, ensuring people can access their homes but need to make journeys on the A roads. 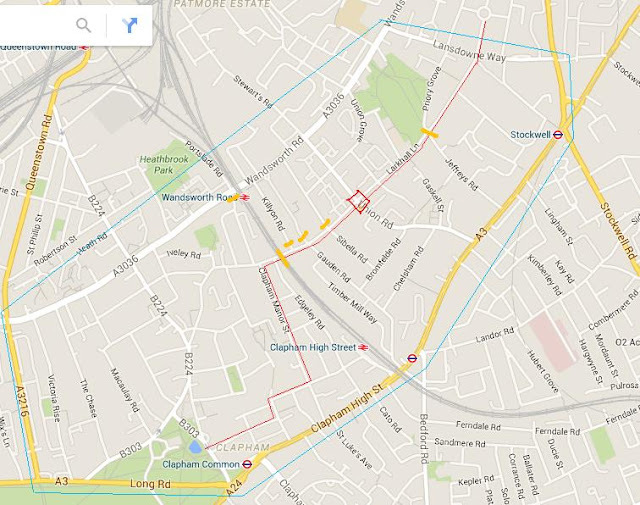 For example, on both Clapham Manor Street and Edgeley Road you could install filters so that motor traffic can enter by one and exit by the other, but not travel from Clapham Road to Larkhall Rise and vice-versa. Within the filtering I'd seek to reduce the distance people can drive along this wide, straight road. c) I'd want to get rid of the traffic lights, but ensure that cyclists and pedestrians have the upper hand at the junction. With more motor traffic filtered out and distances to speed along reduced, I'd narrow Larkhall, particularly at the junction, with attractive planting (couldn't Larkhall Rise make a brilliant Linear Park?) and not have a cycle lane. I'd either have a Zebra crossing or continue the pavement, Clapham Old Town style, across the mouth of Union Road. a) Motor traffic on Larkhall Rise cannot go southbound over the railway bridge (though cyclists can), nor can motor traffic continue north beyond Jeffrey's Road. b) Most of the roads between Larkhall Rise and Wandsworth Road have 'No Entry except cyclists' off Larkhall Rise, or are dead ends. As the name suggests, Larkhall Rise is a gentle hill. It descends from the bridge over the railway line to the junction with Union Road.